It’s the end of an era – the big hurrah-hurrah, doors shut, sparklers last glowing flame goes out to one of my favorite adventures since I started this blog. It has taken 1.5 years, seven seasons, around 300 miles, and who-knows how many calories to complete, yet this weekend, my roommate Sarah and I landed for the last time. While we intended to finish the tour this fall among Oregon’s beautiful scarlet and gold colors, as life goes the trip was delayed – but to our delight the road trip Gods shined down on us once again. With warm Starbucks coffee as sidekicks, Sarah and I ventured north from Eugene along highway 99 toward Junction City mid-Saturday morning. The care ate fog like thick cream of wheat as we crossed our fingers to actually even see the bridges at best. Turning on to highway 36 west, we followed the curvy, two-lane road into the foothills of Oregon’s Coastal Mountain range. 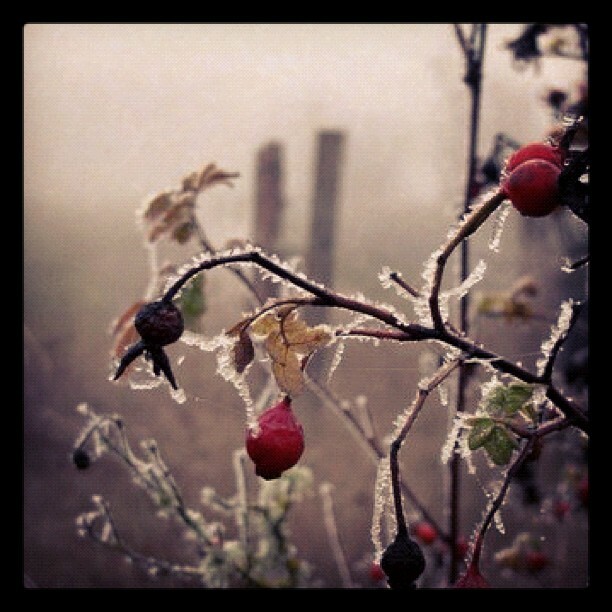 Frost and freezing fog stuck to the road-lining brush leaving little icicles clinging to the stiff plants. Through the fog you could only see the dim outline of country-houses and property fences, as the flat fields quieted for the coming winter hibernation. Slowly though as we climbed ever-so-slightly in elevation the fog rolled down the hills – hiding now only in the deep knolls and the sunlight flickered through the trees like fence lattice. By the time we rounded the bend into the small, water front town of Triangle Lake, the sun had broken free – illuminating the clear, flat water and reflecting the cloudless sky – that had been hidden through the morning. 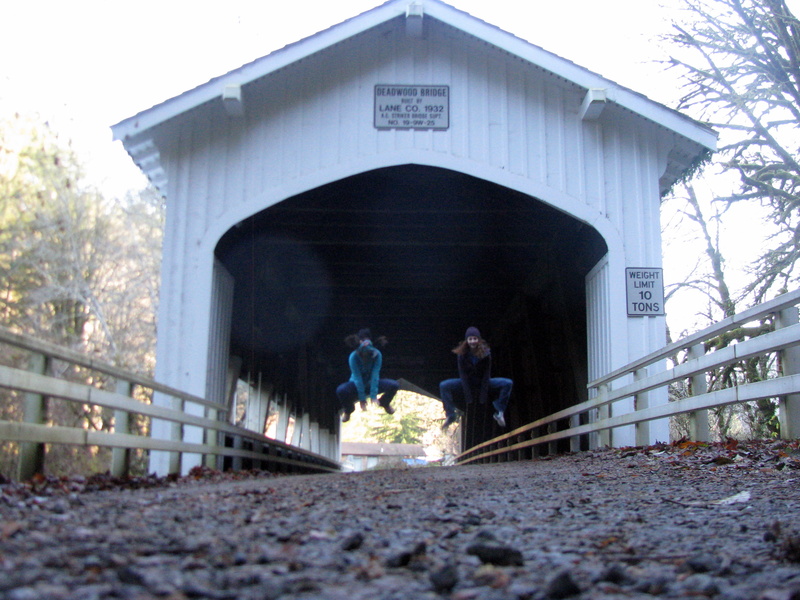 Perfect bridge jumping weather – especially since the limbs still needed some extra blood flow encouragement against the brisk, December air. Continuing along Hwy 36, we pulled off at the first bridge of the day – Lake Creek Covered Bridge. Also known as Nelson Mountain Bridge, this white, covered bridge was built in 1928 (reconstructed in 1984) and spans 105 feet. After 18 jumping photos, we struggled to brainstorm new poses. Yet to our luck, our foolish lack of grace solved that problem – like this strange karate chop action-shot. Only a few more miles down the road, hidden off of Deadwood Creek road (doesn’t it just sound creepy), our last Covered Bridge waited. Deadwood Covered Bridge, constructed in 1932 (restored in 1986), also spans 105 feet and features false end beams and semi-elliptical portal arches with trim. Surrounded by what else – deadwood – and with dark green-gray moss dripping from their crooked limbs, this bridge’s location while slightly-scary in the winter was also very picturesque in the time-has-stopped-here-forever kind of way. Even the damp air felt like it had been sucked downward into a time-warped black-hole – a few degrees significantly cooler than elsewhere along the drive. The damp air and rain also over time skewed the bridge’s floor surface leaving a creaky, slanted character to the wooden structure. Going all-in, we clamored down the bridge – setting up the 10 second timed camera on the gravel ground, balanced on my iPhone to get the just right angle, for this last leap. Lifting from the knees – I got my best height yet in this frogger-style jump – why it took me 20 bridges to finally learn to lift from the knees, who knows! – But what an iconic shot to end this adventure chapter. I would love to continue the journey and complete all 50 covered bridges in Oregon – but officially Sarah’s friendship-bound contract is up – though I might try to twist her arm. We will just have to see! Where should I go next for a leap-along adventure? Who wants to join me? Very cool. What type of camera do you shoot with? Most of the photos on my blog are taken with my iPhone or just my small, old point & shoot, a Canon PowerShot SX100 IS. I used my Canon with a 10 second self-timer for all the jumping photos. I’ve seen many covered bridges in Oregon, an d I love them! What a great idea to see them and explore! I didn’t know about these covered bridges in Oregon. What a fun bucket list item! That is awesome. 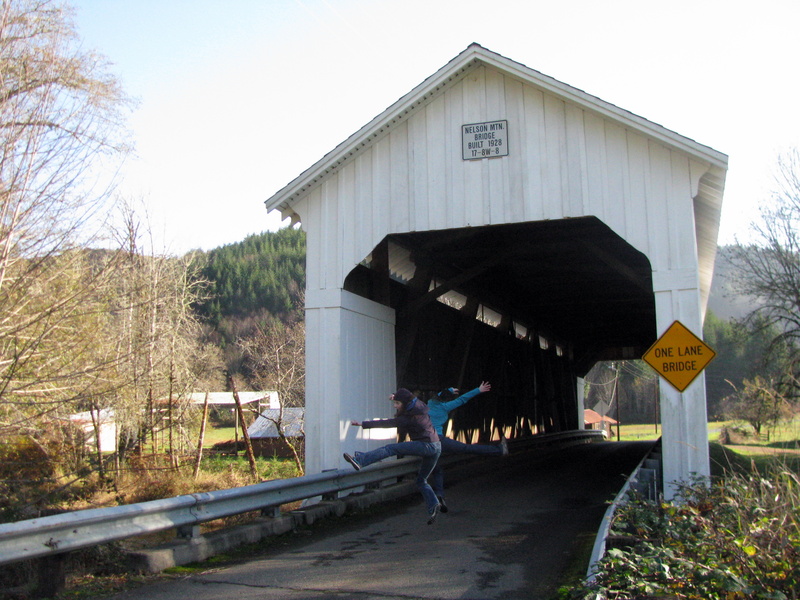 Oregon is my list – I love the covered bridges. So cool. I love your blog and this idea, so super creative! 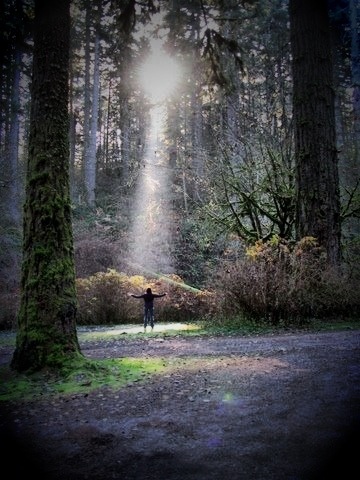 Just came back from Portland for the first time, and I have to say that I so love Oregon! Nice shots! Sounds like a fun idea for a bucket list. I love these pics! So impressive for being just from the iphone or point and shoot. 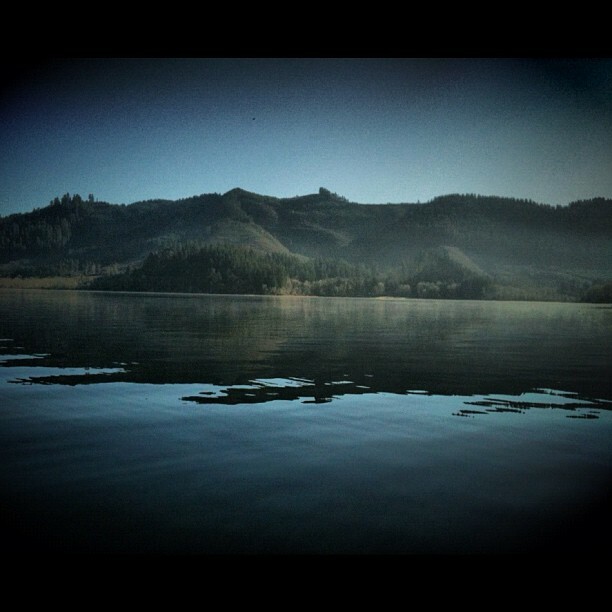 I guess beautiful scenery makes it easier. 🙂 And the frog leap is key. Sun spotlight picture is amazing. This is such a quirky way to enjoy your home state, and get and about exploring new places within. Awesome. Love the Deadwood Bridge jump photo! Ha!